If you need an instrument repaired, bring it on by. 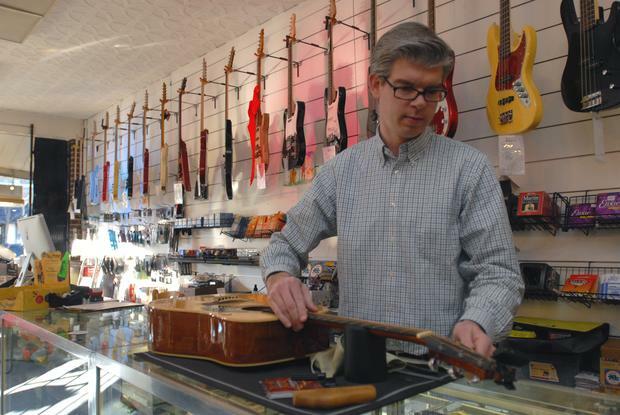 We provide expert work on guitars, basses, ukuleles, and other fretted instruments. We can service your woodwind or brass instrument as well! Guitar restrings include installing new strings, cleaning the guitar, polishing the fingerboard, minor adjustments, and tuning. A guitar set-up includes all involved with a restringing plus fine tuning the guitar action by making adjustments to the neck, bridge, and nut. Electronics can also be repaired, adjusted, and modified. We offer routine maintenance as well as full overhauls on woodwind instruments. Brass instruments can receive a chemical cleaning, dent removal, as well as valve and slide work. We do routine cleaning, lubricating, tuning, as well as full overhauls on accordions. Bring your instrument by for an estimate. Please give us a call at (630) 434-2480 or email us today with questions.